So, You Want to Learn How to Fly Fish? 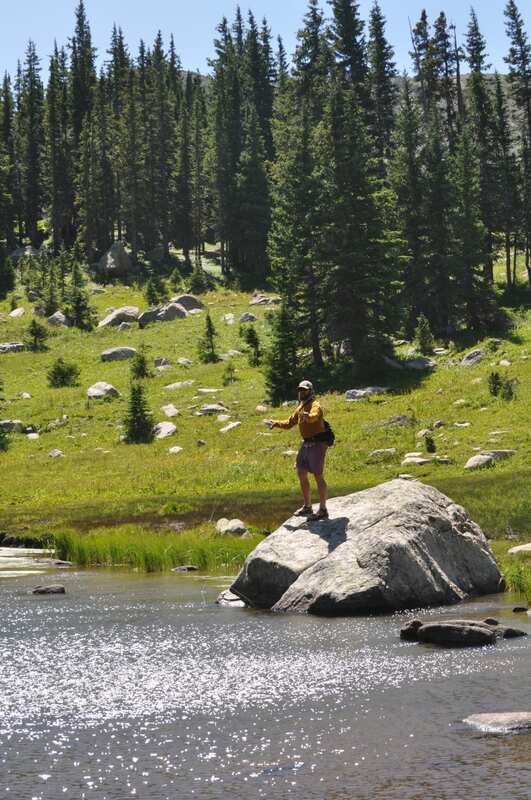 Fly fishing draws people in for many different reasons. Whether it’s the challenge of mastering the elegant cast, the desire for a more intimate understanding of fish that live in beautiful places, or the insatiable ambition to be Brad Pitt from A River Runs Through It, everyone comes to the table with one problem: how to get started. Lucky for you, this ancient sport has collided with the modern world, and it has never been easier to pick up a rod, learn the basics, and catch some fish wherever you live. Fly anglers can pursue any game species in fresh or saltwater, from the industrial Midwest to the suburbs of the Sun Belt to the coastal cities. Aside from the ample fly fishing opportunities around the country, getting into fly fishing is actually not that expensive. With some insider advice on the gear that matters, you can enter the sport with little upfront costs. Our guide here covers all the basics of fly fishing and will give you an idea of what you need to get started. Your local gear shop is going to be the best source of information, but we’ve included some additional resources at the end as well. The most difficult part of learning to fly fish is the cast. In conventional fishing, you cast with the weight of the lure, bait, or sinker to get your line out. 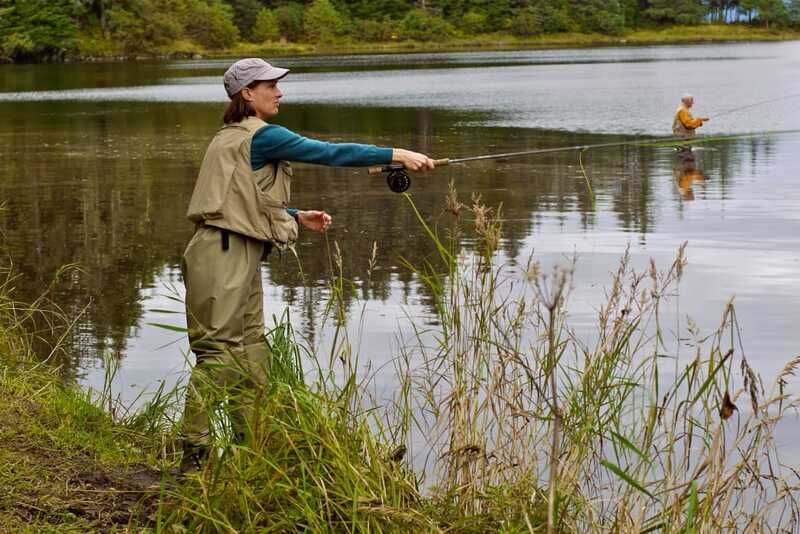 In fly fishing, you cast with the weight of the line, allowing you to deliver a virtually weightless fly. In trout fishing, you may only cast 20 feet, but in saltwater scenarios, you may have to cast 50, 60, or even 80 feet to effectively target the fish. A good place to learn is your local fly fishing shop. Most, if not all, major metropolitan areas have fly shops or an outdoor store with a fly fishing department. These shops often hold free or very inexpensive seminars to learn the basic cast. If you’re a DIY kind of person, shop around for beginner fly fishing setups from different rod manufacturers and check out videos on YouTube. Because you don’t need a fly to cast, hit the park or your lawn and cast until you can hit a frisbee 20 feet away with the end of your leader. A good setup should cost between $150 to $250 with a rod, reel, and most importantly, fly line. (You can also check Craigslist or look for used rods at a fly shop.) As a rule, your line is always more important than your rod or reel, so look into upgrading to a premium floating line to ease the learning curve of casting. Fly lines and fly rods are classified in weights so that you always know what you need. The lines range from one (for very small fish) to 8+ (for large, powerful fish). For example, if you plan on fishing mostly for trout, panfish, and some bass on a pond, a 9-foot rod rated for 5-weight line is a solid setup. If you live in a coastal area, consider a 9-foot, 9-weight rod to throw bigger flies and land bigger fish. From your fly line, you need to attach a tapered leader. The leader is typically made out of nylon monofilament, like conventional fishing line, but it starts out thick and tapers to a fine point, allowing the line to "roll out" instead of bunching up at the end of your cast. Start with a 7.5 or 9-foot leader and ask your fly shop or retailer for the right strength depending on this fish you plan on catching. The last 18 or 24 inches of your leader (towards the skinny end) is called the tippet. This is the business end that you tie the fly too. When you buy your set up, get a spool of tippet to replace what you cut off when changing flies or breaking your line, and be sure to match it with the leaders that you choose. What makes this the ultimate fly fishing shirt? Once you learn how to cast at least 20 feet with your new outfit, it’s time to try and catch some fish. There enough different species, techniques, and flies to keep you learning for the rest of your fly fishing life, but there are a few universal rules to get you started. First, start with a small black woolly bugger as your first fly. They will catch almost anything that swims, and are good for getting the hang of things. Practice casting around logs, rocks, or the bank, let it sink a little, and "strip" (pull) the fly back to you at different speeds to see what works. In small streams, look at the other bank and cast your fly upstream at your 3 o’clock position (or 9 o’clock if that’s upstream) and let the fly drift until it’s all the way down on the other side. Strip it in and repeat. After three attempts, move to a new spot. The main point of this strategy is to practice "presenting" your fly to the fish without spooking it. Your leader is clear and largely unintrusive to the fish, but your bright colored fly line is pretty scary, so do your best to never let the fly line pass over a fish. To avoid this, make sure you fish at least 10 feet ahead of where you are and gradually cast further out. You may see a little rainbow swimming in the far pool but totally miss the trophy brown trout hiding just behind that rock in front of you. 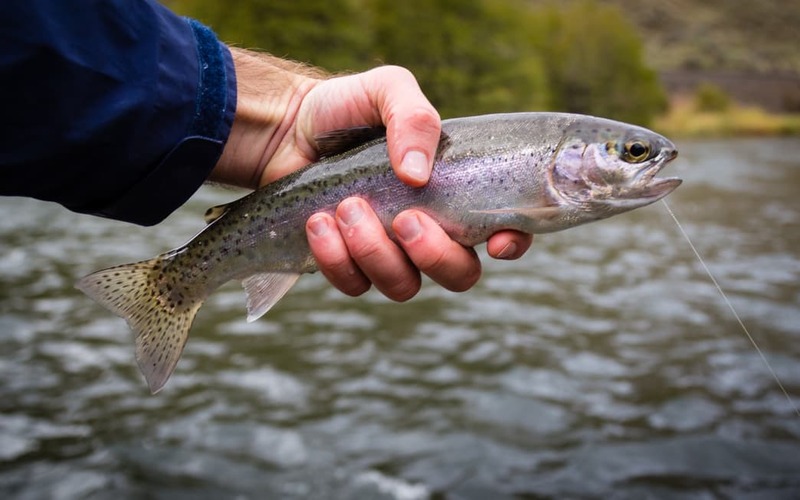 If you can master fishing with a wooly bugger, start expanding your fly knowledge by looking at dry flies and poppers (flies that stay on top of the water), wet flies that imitate juvenile bugs (like nymphs, crayfish and minnows), or even shrimp and crabs if you fish saltwater. Your fly shop wants to help you and earn your business, so never be shy to ask about effective flies and how to fish them. Just be aware of what is and is not allowed where you plan to fish—some places have regulations about what kinds of flies or bait you can use. Like other forms of fishing, a farm pond is the best place to get started. Luckily, Tennessee has lots of those ponds that will help you refine your cast and become more comfortable with knots, gear, and your fly box. When you’re ready to move on to bigger water and the chance at a bigger fish, check out some of the best places to fly fish in Tennessee and pay attention to the difficulty. 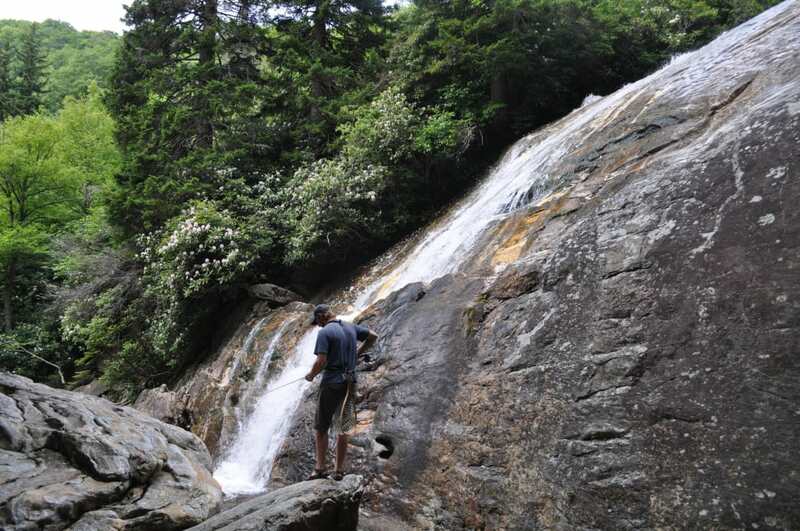 There are lots of trout streams and rivers in the Smoky Mountains (which are wonderful even when you don’t catch anything) are adequate for beginners and will certainly give you a shot at catching a memorable fish. If the far eastern part of the state is too far for you, check out the Harpeth River, Reelfoot Lake, or even the Mississippi River through Memphis as closer destinations for warmwater species all year round. Every day, a fly fisher learns something new about the cosmic world of fish and their underwater home. Whether you only fly fish from a dock for summer bluegill or fish for wild trout in the crystal clear Rocky Mountain streams, you’ll never get tired of feeling your cast deliver a delicate fly and fooling a that wily fish. Written by Charlie Morgan for RootsRated in partnership with BCBS of Tennessee. For those of us who share in the spirit of discovery, this cotton canvas explorer shirt w/ roll-up sleeve tabs comfortably gets us to where we may not even know we're going. The shirts that Trout Unlimited describe as "clearly designed by fishermen, for fishermen" and "stylish enough for post-fishing cocktails."